“Simplicity is the ultimate sophistication,” claims the marketing brochure for the Apple II. Although Apple designed products for consumers, it is just as important for enterprise-level products to share that approach. One of the best ways to find solutions that consumers really need is through lean product management and development. Staying lean creates simple, useful products. At the beginning of every product development cycle, or when you are creating new software, it is absolutely critical to define and then create a Minimum Viable Product (MVP). MVPs use customer feedback to ensure that product teams increase efficiency and reduce waste, while developing simplified solutions that customers really need. When designing an MVP, it is not what you do, but what you decide not to do that is critical. Teams should only devote time to features that are needed to deliver the product to market. As simple as this sounds, it is one of the hardest things for a Product Owner, and his or her software team, to do. Anything else will only waste time, money, and market position. 1. Focus on validating customer problems first and foremost, rather than pursuing preconceived features, solutions, or ideas. Solutions come from problems, so it’s critical that teams focus on customers’ core needs, rather than building feature sets based on unvalidated ideas. After all, features that don’t solve actual problems aren’t really solutions. One of the biggest benefits of the MVP methodology is the reduction of irrelevant features. When you base your feature set on customer feedback and user testing, there’s a smaller risk of wasting time and resources. Also, and just as importantly, “problem-focusing” decreases development time and ensures that each iteration of the product will be released as quickly as possible. Non-critical features can always be added later. 2. Ensure that product development teams are aligned with customer needs via a continuous customer feedback loop. To effectively validate and test, it’s vital that every product development team maintains a constant connection with the user base. The customer feedback loop should be established at the outset of every development cycle and continue indefinitely past product launch. Create a stage-based user research strategy that will allow you to incorporate feedback, testing, and experimental data at every point during a product’s life cycle. 3. Follow the build-measure-learn MVP methodology to ensure that feedback and learning are constantly validated through experimental data. 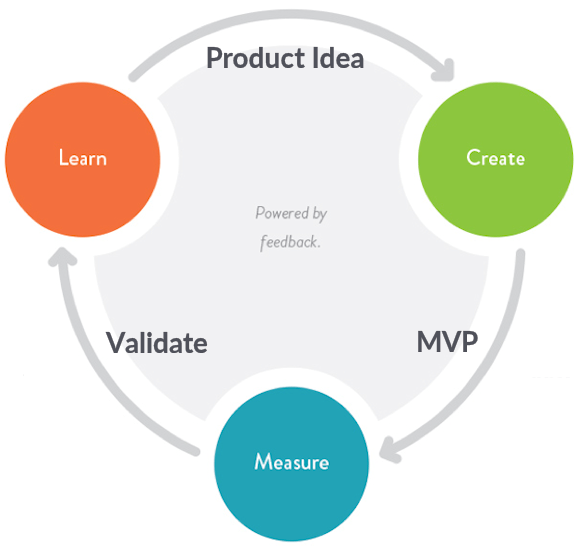 Lean product managers should base their approach to MVP creation on a build-measure-learn cycle. By following these lean management principles, product managers and their teams can accelerate the product development cycle, decrease wasteful spending, ensure that products fit the market, and solves customers’ actual problems. An MVP typically prioritizes functionality, but it’s essential to measure one other aspect during the development cycle. All products, including enterprise-level products, should devote time and energy to crafting a great user experience that moves the product from a Minimal “Viable” Product to a Minimum “Loveable” Product . People who enjoy using products have a much different relationship to those products – and the brands that created them – than those who use a product because they must. This is where a product gets elevated from a “need” to use it to a “want”. To create a product that your users will love, you need to validate it through the entire product lifecycle – before, during AND after your product or new feature is launched. Repeated user experience testing is the key. These tests, which can be quite simple, will move you from a product that your customer needs to one that they enjoying using. This is the nirvana of product development that often gives birth to simple, elegant solutions that customers love. This is the third and final article in a series discussing personal experiences with QA and continuous delivery. The first article is located here; the second is here. Months ago I wrote a blog about appling Agile methodologies to raising my two girls. My goal was to minimize yelling and screaming and create more order in our lives. I achieved my goals. I recently revisited an old blog I wrote on technical documentation after running into a problem with some REST API documentation. In case you missed it, you can read the blog here. The process of resolving the issue – along with other experiences accumulated over the year – has me firmly convinced that several of the rules I postulated in the blog (points two through four to be precise) should be part of every development teams golden standard. I know they will be for mine.